(Above): Syrian women sewing at Denison House, Boston, 1912.
reputedly second only to New York’s in size. 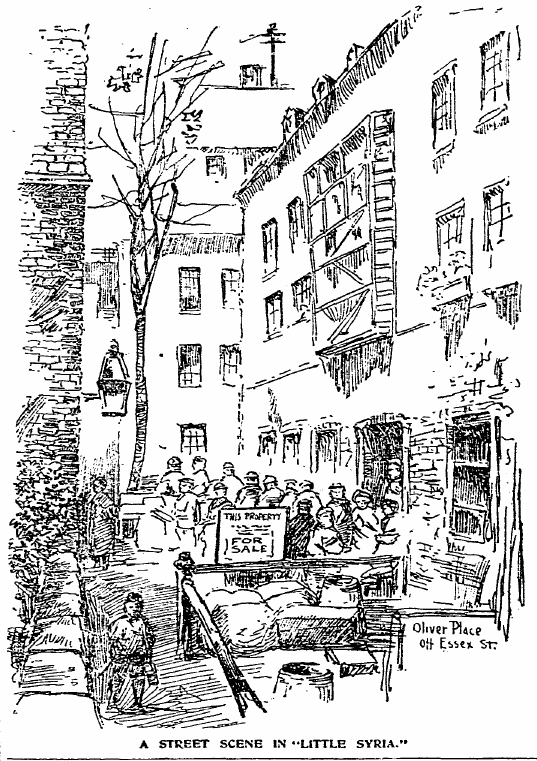 The Boston Syrians lived in a tightly circumscribed South Cove neighborhood whose hub was Oliver Place, a street which became synonymous with the colony. Similarly the New York colony lived primarily on Washington Street on the lower west side of Manhattan and was associated with it. Both neighborhoods were made up of mid-century single family homes that had been converted to crowded, unhealthy tenements. Both were built on landfill, which meant that the tenements were not only crowded and dirty, but damp and often flooded. The earliest members of both colonies were exclusively Christian (unlike some of the Syrian settlements further west), and these cities were home to the first Syrian churches in America. Like most early Syrian communities, the majority of new immigrants—both men and women—were peddlers. The Boston colony was established in 1890, a full decade after New York’s. Since New York harbor saw the largest and earliest influx of Syrians, it was natural that they would settle in New York first. The Boston colony was much smaller, less than one-third the size of New York’s, but one should remember that the population of Boston was one-twelfth that of New York. If, as many advocated at the time, one included the forty surrounding towns in the definition of “Boston,” the Syrian colony would certainly be much larger than that of New York. The employment profile of the two colonies was completely different. Although the earliest Syrians were peddlers in both Boston and New York, by 1910, the Boston Syrians were largely wage earners rather than self employed as in New York. The 1910 census shows 37% were working in large mills and factories, commuting every day to the surrounding towns, which were easily accessible from Boston by the newly-installed electric trolleys. 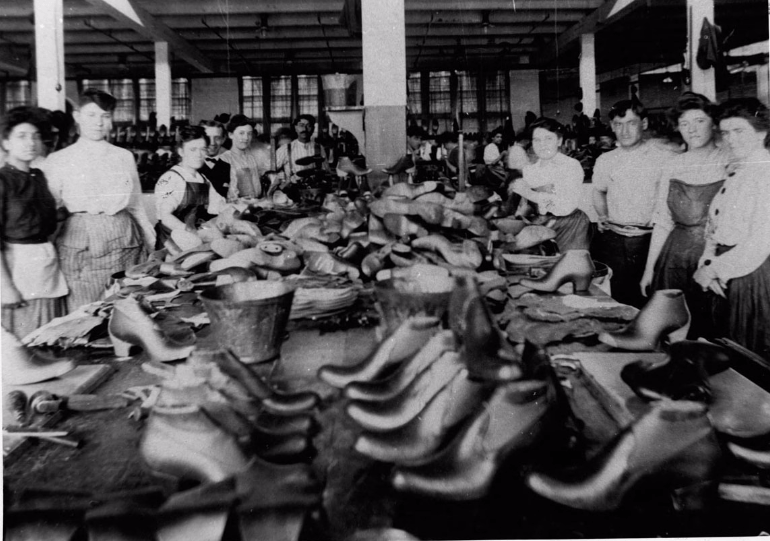 The largest concentrations of Syrians were in rubber shoe factories. Assembly line, Hood Rubber Company, Watertown, MA, ca. 1900. Left and right shoes were assembled on opposite sides of the table. In the 1910 census, only 10% of Boston Syrians were self-employed, in contrast to New York, where Syrians began opening their own businesses in the 1880s and continued unabated until, in 1908, the Syrian Business Directory lists more than 400 Syrian-owned businesses. Boston had 38. Because new, poorer immigrants took the place of some of the more prosperous who had moved to the suburbs, and these new immigrants were wage laborers, the Boston colony was poorer than that of New York. Mills and factories paid barely enough—or not enough—to live on. Newspaper articles and reports by social workers emphasized Syrians’ poverty, their degraded living conditions, and the moral peril of living in such conditions. Fifteen percent of the families applied for assistance from private and public aid agencies in 1900. There were no home-grown newspapers, book publishers, or self-help/self-improvement societies until the second decade of the twentieth century, unlike New York, where a half-dozen Arabic newspapers and books were published in the nineteenth century and many more appeared in the first decade of the twentieth. The earliest arrivals and more prosperous members of the colony began to move to the surrounding towns around 1905; some were able to buy houses. The Boston colony was thus continually replenished and enlarged by new immigrants, many of whom skipped the peddling phase and went to work directly in the mills. Nearby mill towns like Lawrence, Worcester and Fall River all had large populations of Syrians, the majority of whom were employed as unskilled laborers. Lawrence was the home of the first Arabic newspaper founded in Massachusetts—al Wafa—in 1907, and Syrians in Lawrence participated in the famous Bread and Roses strike of 1912 (a 17-year old Syrian boy, John Ramey, who grew up in Boston, was one of three strikers killed). In short, the Boston colony, notwithstanding its position as second in size to New York’s, was a pale reflection of it. There were bright spots, however. Denison House, one of the earliest college settlement houses, was founded in the neighborhood in 1892. It provided training, education and activities for Syrian (and many other) immigrants, who otherwise might have languished in their tenements. The young Kahlil Gibran frequented Denison House and was introduced to his first mentors through it. Much of his early art and writing were produced in Boston, and although he moved to New York in 1912, he continued to have strong connections to Boston intellectual circles, both American and Syrian. The Boston colony, helped along by Denison House, set him on his path, as it did so many others. –This is first in a series of blogs about the Syrian colonies in the U.S. in the nineteenth and early twentieth centuries.